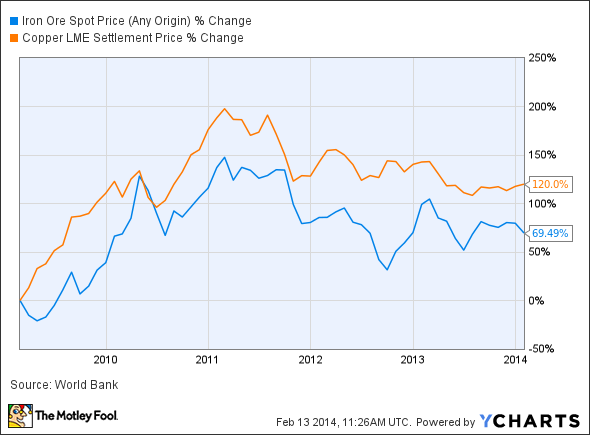 Good Times Ahead for Caterpillar and Joy Global? The case for buying into the mining equipment sector is based on the hope that mining companies' capital expenditure plans will improve in 2014. It would be an understatement to say that mining had a difficult year in 2013, and it was even worse for the mining equipment suppliers like Joy Global (NYSE:JOY) and Caterpillar (NYSE:CAT). However, investing is about what happens next, and the case for buying into the sector is based on the hope that mining companies' capital expenditure plans will improve in 2014. So, what do Foolish investors need to know before warming to the idea? The market took heart from Caterpillar's recent results, and this should be taken as a marker that the sector can go higher given any signs of a bottoming out in spending plans in the mining sector's spending plans. While, Caterpillar's management were careful not to call a bottom, its guidance for 2014 implies "some improvement" in order rates. Indeed, in the recent conference call, management were asked if their forecast for a 10% drop in its 2014 resource industry segment sales implied a pick-up in second-half orders rates or not? In answering the question, Caterpillar's VP, Mike DeWalt replied: "And so I think to answer your question, we do need some improvement in order rates to be at minus 10, but I wouldn't describe it as anything like robust or good or like 2012. But yeah, some improvement." In addition, Caterpillar expects its construction and power segments to be up 5% respectively in 2014, leading to flat overall sales growth. While, a 10% decline in its resource spending isn't anything to write home about, it does imply the beginning of a bottoming out process. Especially, when considering that Caterpillar's resource industry sales declined a whopping 48% in the fourth quarter of 2013. Time to pile into mining capital equipment manufacturers? The market has got excited by this sort of commentary, but there are four key reasons to remain a little cautious. First, ultimately, commodity price movements are still likely to dictate spending conditions in the industry. Iron ore pricing is critical for coal demand, which in turn is key demand driver for mining equipment. Copper is included because it's usually seen as a highly responsive to economic growth conditions. Both indices are suggesting that difficult conditions remain, and an investment in Caterpillar or Joy Global is still going to be a directional play on commodity prices. The magnitude may differ, but the direction is unlikely to do so. Second, Caterpillar is increasingly reliant upon growth conditions in China. The country's growth is obviously a key determinant of global commodity prices, but there are also some country-specific issues for both companies to deal with. For example, China's state media reported an investment product -- linked to an indebted coal company -- failed to repay investors upon maturity recently. While, the repercussions of these stresses on the China shadow banking system are uncertain, it's beyond doubt that China's coal industry is facing overcapacity issues. Moreover, Caterpillar grew its overall sales to China by more than 20% to around $3.5 billion in 2013. While, this is a small amount compared to Caterpillar's $55.6 billion in 2013 revenue, its revenue growth in China represents a figure in the ballpark of $600 million. This is not an insignificant figure considering that Caterpillar's overall revenue declined by $10.2 billion 2013. Third, Caterpillar's relatively positive outlook is based more on correcting its inventory position with its dealers rather than a bullish prognosis on the mining industry. Caterpillar suffered in 2013 as its dealers were forced to sell down excess inventory caused by a drop-off in end demand. On the conference call, management argued that 2014 would not see these kinds of conditions repeated, but again, this is still contingent upon end-demand across its segments. Fourth, current commentary remains negative across the industry. For example, General Electric reported that its mining orders were lower by 60%, while Joy Global saw its order book decline by 19% in its fourth quarter. Furthermore, Joy Global's outlook statement recognized the ongoing imbalance between supply and demand in the mining industry: "While demand has increased modestly, it has not been enough to counteract the higher level of supply, and market forces have resulted in pricing declines to balance these conditions. This pricing pressure will continue to drive the closure of high cost uneconomic mines across the sphere of commodities in which the company operates." Fortunately, it's not all doom and gloom for Caterpillar. The construction and power systems segments contributed 35.5% and 40.8% of total system sales in the fourth quarter, and management expects 5% growth from both segments in 2014. A recovering construction market in North America and a bottoming out in Europe offers upside to Caterpillar's segment results. However, if China's growth falters in 2014 then it's hard to see how commodity prices will move higher and this will ultimately hurt Caterpillar and Joy Global's prospects in the mining capital machinery market. Throw in the fears over financial conditions in China's coal mining industry and there are enough short-term concerns to warrant some caution in both stocks.